This chapter examines various service delivery models being used around the world. It discusses models of inclusion, in which all students are placed into the public school educational arena and the regular education teachers provide the services to the student with special needs while the special education teacher is used as a consultant. It continues with a discussion about other types of service delivery models, such as separate schools or even institutions away from family, friends, and society. It concludes with a discussion about the future trends within the field of special education service delivery models and what can be done to improve them. 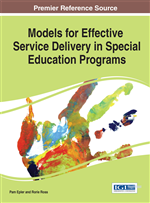 The bulk of this book has focused on service delivery models currently being used in the United States with students with disabilities. Following is a discussion of different service delivery models around the world, some very similar to U.S. models, and some vastly different.